Montana Tech's on-campus Industrial Hygiene graduate program provides an exceptional opportunity for advanced study in the field of occupational health. The overall goal of our Industrial Hygiene program is to provide individuals with the technical competence to anticipate, recognize, evaluate, and control occupational health hazards. This Industrial Hygiene degree program is accredited by the Applied Science Accreditation Commission of ABET, http://www.abet.org. The thesis research-based M.S. degree is structured to encourage participative, collaborative, and applied problem-solving strategies to address modern day occupational health issues. Courses and research in the M.S. Industrial Hygiene program are facilitated by world-class faculty whose advanced academic preparation and professional experience help integrate academic theory with current practical application. The curricula is designed to provide graduates with the academic preparation needed to pass the certification examination administered by the American Board of Industrial Hygiene. Industrial hygienists play an important role in ensuring the workplace is as free from hazards as possible and that the workers and the community at large are protected from potential health threats. Moreover, industrial hygienists work with management to anticipate problems that could occur and take action to prevent them before they happen. Also, industrial hygienists play an important role in shaping and implementing government policy concerning worker health and safety. Job diversity is a major benefit to consider when choosing a career in the health/environmental sciences. 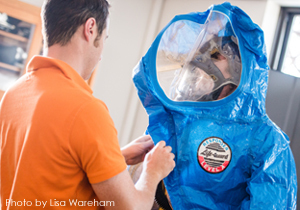 A wealth of unique employment opportunities exists for industrial hygienists. Unlike many other professions, industrial hygienists are not limited to one particular type of industry. They are employed in a variety of organizations such as public utilities, government, academia, research laboratories, hospitals, insurance companies, consulting firms, oil, chemical and manufacturing companies, and mining operations. For information on enrollment levels and graduations during the past few years, visit the Montana Tech Institutional Research Office web page. We have established admittance standards for the M.S. Industrial Hygiene program to ensure student success. Applicants are admitted on a basis of acceptable undergraduate academic preparation, graduate record exam (GRE) scores, personal statement and reference recommendations. Applicants must have a bachelor’s degree from a regionally accredited college or university that included as a minimum 19 credits of college-level mathematics and science, (including first semester calculus and statistics), biology (including anatomy/physiology), chemistry (including organic chemistry), and physics. Prospective students who meet these requirements and who have at least two years of professional work experience in occupational health and safety may also wish to consider our online program in industrial hygiene. These deadlines are also applicable to Montana Tech undergraduate students applying to the 5-year Master's Degree Program. Establish their IH-related careers throughout the first four years after graduating. Use their education to competently provide IH services appropriate to their employment. Student outcomes are statements of what each graduate of the program is expected to achieve at the time of graduation. The M.S. Industrial Hygiene curriculum is structured so each student will have obtained the knowledge, understanding and skills in all 22 student outcomes.